Hi guys! 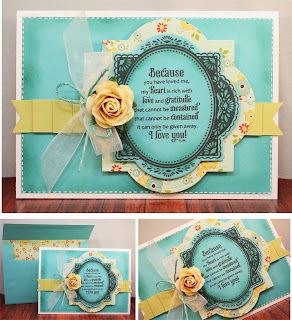 Jamie back with you again today sharing a feminine card using lots of fabulous products from CutCardStock.com! 1. 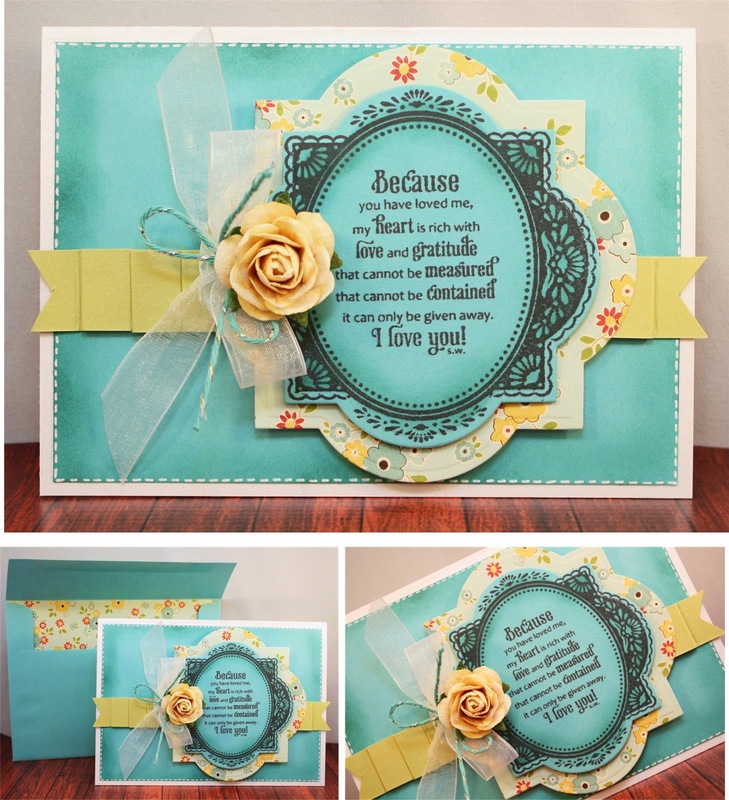 Cut out the large die cut shape with patterned paper and emboss. 2. Next cut out the Blue Raspberry Cardstock with the smaller die cut shape and emboss. 3. Place the cardstock piece back in the die cut shape and tape to a piece of scrap paper. Ink around the edges with a like color of ink. 4. This is what your cardstock piece should look like now. 5. Stamp the border and sentiment stamp in the center of the cardstock piece. 6. Your piece should look similar to this image now. 7. Cut a mat from the Blue Raspberry Cardstock to fit your cardbase then ink around the edges using the same ink as you did for your die cut piece. 8. Adhere your mat to your cardbase. 9. Cut a 3/4" strip of the Curious Metallic Lime Cardstock and score every 1/2". 10. Fold every other score line on top of each other and adhere down with glue dots on both sides of the cardstock. 11. Continue doing this all the way to the end. 12. Cut folded cardstock as shown then cut triangle shapes out of each end. 13. Adhere the folded pieces to your card as shown. 14. Using the Uniball Signo White Pen create dashes around the edges of the mat for stitching. 15. Adhere your large patterned paper die cut with foam adhesive as shown. 16. Adhere your sentiment die cut with foam adhesive to the center of the other die cut. 17. Cut a piece of the white Organza ribbon and tie in a bow. Tie a piece of coordinating twine around the bow. 18. Adhere the bow to the left side of the die cut set using a glue dot. 19. Your finished card should look like this! 20. Next we are going to add patterned paper to the envelope to make it coordinate with our card. Cut a 1/2" strip of paper and add it to the front left side as shown. 21. Next cut a piece of the pattern paper just slightly smaller than the inside width of the envelope (it does not have to fit the length, just enough to cover the opening that they will see). 22. Adhere the paper inside the envelope. 23. Now we have a matching set! Here is another look at my finished card!